a soundtrack by Crystal Castles perhaps. Hope you enjoy the interview. Bryn Oh: Where are you from? And who are the most renowned artists from your country in your opinion? Mikati Slade: I am from Japan. I think Yoko Ono is the most renowned artist who's from Japan. I saw her work titled "Freight Train" at an exhibition in my town a long time ago. It featured a real freight train with a lot of bullet holes. At night, all the bullet holes illuminated with light coming from inside the train. The theme was quite serious, but also beautiful at the same time. Bryn Oh: Often the average person outside SL is perplexed with virtual worlds in general. When people unfamiliar with the virtual ask you what you do how do you explain it? Mikati Slade: One of the unique things about virtual worlds is the various cultures that form in them. Art, fashion, music, and other creative and social pursuits give rise to different cultures. This makes virtual worlds quite a bit different from other online game products. And this is the point that I try to explain to people who are unfamiliar with virtual worlds. Bryn Oh: Who are a few of your favorite artists and why? 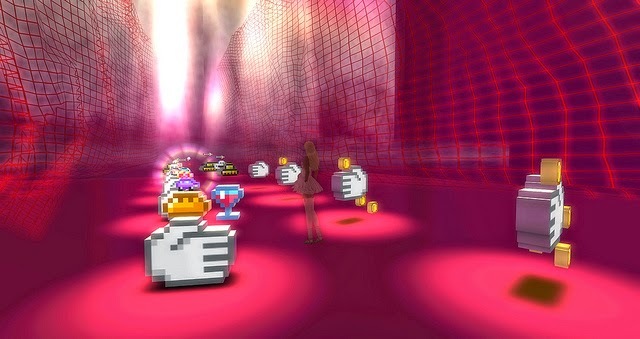 Mikati Slade: In virtual world, Bryn Oh (Canada) made works of great importance in the art history of virtual worlds. Her works gave me some of the inspiration for "KURU KURU WORLD" (2011, MiC: Museums of Rome Capital) which I consider as my best work so far. Merlino Mayo's (Italy) solid sculptures always remind me of that special Italian beauty. I learned a lot from him and he's also opened many doors for me in Second Life's art world. 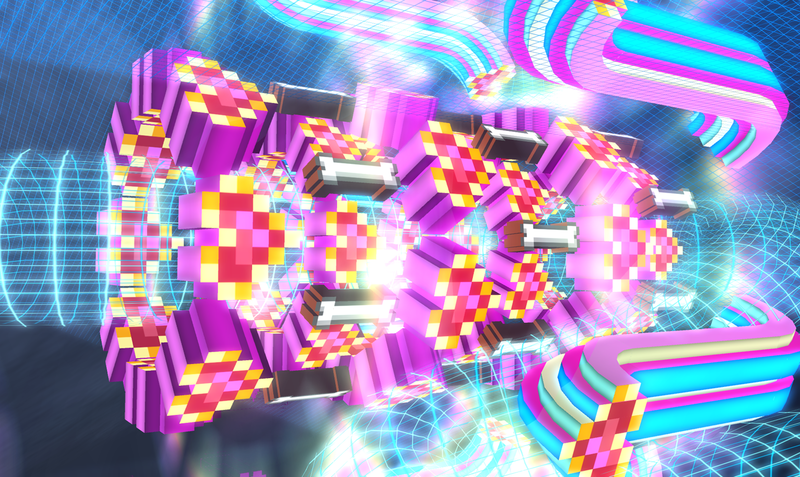 SaveMe Oh (Netherlands) is the real "avant-garde" art-performer in virtual world art. She is always trying to create real happenings and get real reactions from people. Lastly, Maya Paris (UK) and Simotron Aquila (Italy) are among my favorite artists too. I learned the basis of visual creation by drawing the works of ancient Greek and Rome sculptors. In the real, atom world, I find the works of Leonardo da Vinci (Italy) to be full of information and a sort of "universe" in their own right. 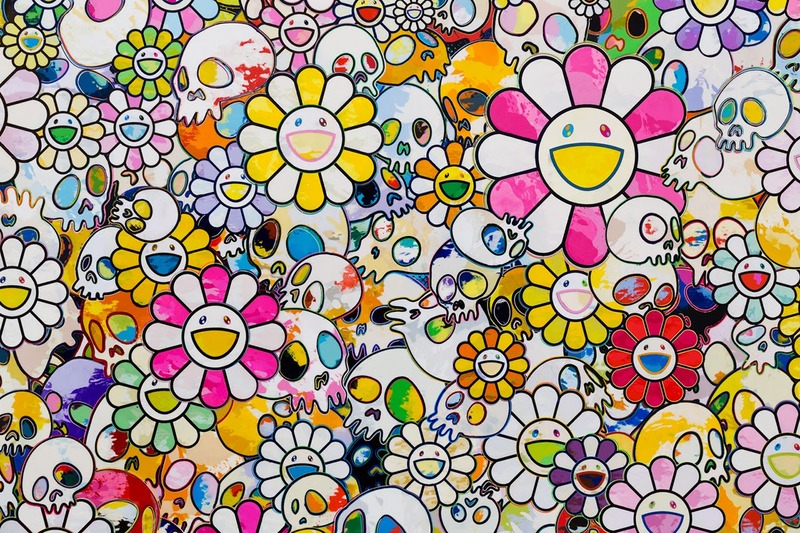 I consider Takashi Murakami (Japan) to be the best Japanese contemporary pop artist. 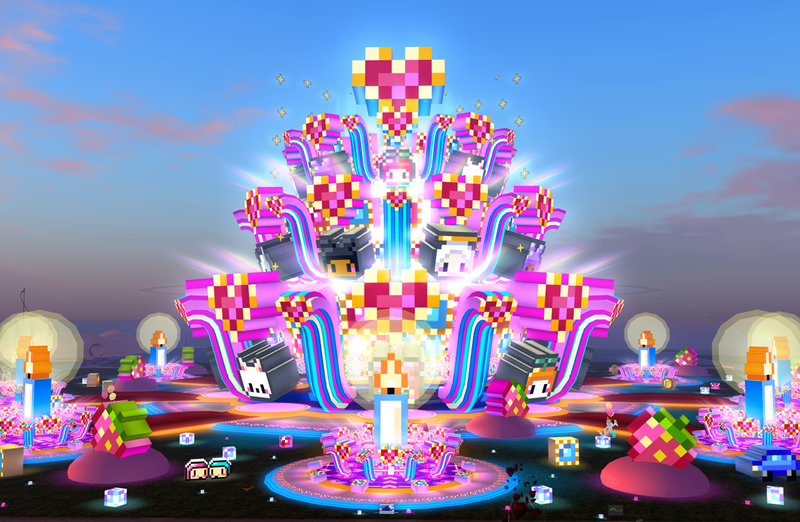 He succeeded in joining Japanese pop culture with the western art context of virtual worlds. Bryn Oh: Whose artwork do you personally dislike the most and why? Bryn Oh: Which of your own works are you most proud of? Do you feel any failed and if so do you now know why? Mikati Slade: I am most proud of KURU KURU WORLD. It exhibited first at MiC: Museums of Rome Capital in 2011, and then at LEA: Linden Endowment for the Arts in 2012 (as part of PICO PICO LIFE). It was themed on the cyclical nature of human civilization. 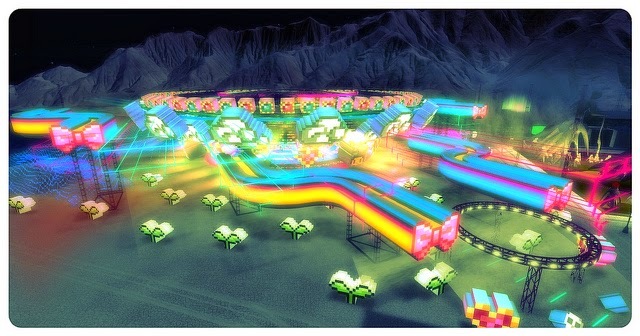 It consisted of six large areas that featured Japanese pop 8-bit pixel-style buildings. More than 50,000 people visited the two exhibits. It was a big break for me. In addition, it was the first time I ever used multiple separated areas to tell a story and I learned a lot from this. I am also proud of BUDS (2011). This was one of my earlier works. It was themed on the Fukushima disaster of March 2011 in Japan. I made the artwork a month after the disaster. At the moment, the situation was still desperate, so I tried to express some hope for the future through it. The artwork featured bud leaves and children as symbols for a new tomorrow. I do not feel as if any of my works failed, at least not in a big way :) I am always critical of my own past works and try to improve the next time around. Bryn Oh: Do you have a method when creating? If so how does it often progress? For example do you sketch or write out ideas first for weeks or do you perhaps just jump directly into the project with little planning and adapt as you go? Mikati Slade: At the beginning, I try to visualize the visitors' probable view frames. What would they see when they visit and explore my artwork? This determines the scale of the artwork and the placement of its most important parts. After that, basically I start to build it right away. I care for the physical in my artwork very much and I receive good feedback when I can interact with the structure and touch its various parts. Second Life is great for seeing and experiencing the artwork while it is being worked on. Bryn Oh: What are you currently reading, listening to or looking at to inspire your work? Mikati Slade: Recently I enjoyed reading "Otaku: Japan's Database Animals" by Japanese philosopher Hiroki Azuma. The book is about Japan's otaku culture in the postmodern age - how the otaku simply play with elements from their "cultural database" without being interested in telling a bigger story. "DAICON IV Opening Animation" (1983, Japan) is one of the most important sources of material for the otaku. Bryn Oh: Does your work have an overall theme and if so what might that be? If not please describe how you tend to pick your topics. Mikati Slade: The overall theme of my work is simply "positive energy for life". Our world and life is merciless and disappointing many times. So I try to cheer everyone's life around the world with my work. Bryn Oh: Have you ever had to deal with negative publicity or a disappointing rejection of your artwork? How do you deal with it? Mikati Slade: Basically I had not :D The virtual world is an international place and we have people from many different cultures in here. So I have always cared to communicate with them through my art using simple and direct ways. Bryn Oh: Would you like to take a stab at explaining what defines virtual art? Mikati Slade: Ok. Virtual art is art that is made for and exhibited in a virtual world. 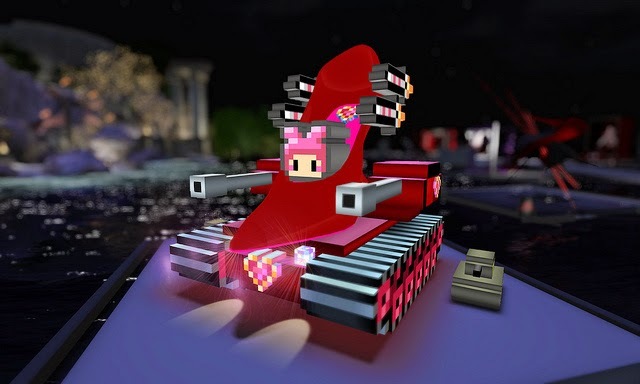 The virtual world is a new medium for art. And it differs in many ways from other mediums. For example, in a virtual world, the concept of gravity is an optional one. You may choose to ignore it. This means that virtual worlds could offer unique contexts for object shaping. Virtual world artists can use these unique contexts to develop new artistic expressions. Bryn Oh: What would you say makes virtual creations unique over other art forms? Mikati Slade: Two reasons. First, this is a virtual world. Making and viewing art here is highly immersive. It is easy to be drawn into and absorbed by the art. Second, anyone around the world may view it. Where they live doesn't matter; there are no nations here. Bryn Oh: Centuries ago there was no such thing as an "artist" just craftsmen, as time progressed superior technical ability and creativity created the elite "Master" artist whose work stood recognized above all others. In 1917 Marcel Duchamp submitted a work entitled "Fountain" to the Society of Independent artists. He stated "... He (the artist) CHOSE it. He took an article of life, placed it so that its useful significance disappeared under the new title and point of view created a new thought for that object" He wanted to shift the focus away from technical craft to more of an aesthetic intellectual interpretation. Some say that because of him almost everything is considered art today. From an elephant painting with its trunk, a Banksy, a child's drawing to someone vomiting paint onto a canvas. What is your perspective on this? biggest artists of the twentieth century. His work opened up new possibilities and started a new trend in art. Duchamp's art was regarded as something that was very different from classic art. But, really, the two are not that different. Classic painters used dye on a canvas, Duchamp used regular objects. The materials were different, but art is more than just the materials used. Observation (which leads to the acts of "choosing" and "placing" of the materials) is of the utmost importance in art. Artists have to learn through observation what will work or not, which approach will be most effective. Duchamp and other great artists were masters at that. Observation gives rise to "signs" and "meaning", the "conceptual". 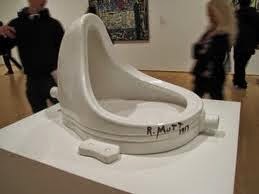 Duchamp's art was conceptual. Really, though, all art, both before and after Duchamp, is conceptual as it is borne out of observation. Observation is at the root of all art. Little Bee Visits Kuru Kuru World from Little Bee on Vimeo. Mikati Slade is a digital artist based in Japan. Studied classical sculpture and drawing at an art university in Tokyo. Earlier work includes illustration and graphic design on print media. Later work includes digital sculpture installations in the popular online virtual world of Second Life. Currently preparing to open a sim in Second Life. I enjoyed this v much. As neat as a pin! Was there a happy ending?? Enjoy your interviews. Thanks Bryn Oh and artists. I enjoyed the interview too...her art is not my taste but its good to look at what people are doing..and you are right, It made happy too.